Lovers of classical music with a spiritual emphasis that is performed for a worthy cause are in for a treat on the evening of April 9 in St. Charles Borromeo Seminary’s beautiful St. Martin’s Chapel in Wynnewood. The benefit concert, with the theme “Music, Mission and Faith,” will assist the seminary’s Spiritual Year program. The concert will be led by Rudolph Lucente, who is the director of sacred music for the seminary and organist for the Wanamaker Organ at Macy’s department store in Philadelphia. Joining him will be St. Charles’ Artist in Residence and Philadelphia Orchestra organist Michael Stairs and Colin Howland, the organist for 10th Presbyterian Church in Philadelphia. Also featured will be trumpeter Brian Kuczyk, the lead trumpeter for several classical ensembles in Philadelphia and Delaware. Vocals will feature Amanda Frederick, soprano; Toffer Mihalka, tenor; John Frederick, baritone and Kaitlyn Tierney, alto. The concert is reminiscent of the music performed for the September 2015 visit to Philadelphia by Pope Francis. “St. Charles Seminary is pleased to offer a unique opportunity for guests to walk in the footsteps of Pope Francis while also enjoying a beautiful evening of music and song under the direction of our new director of sacred music, Rudolph Lucente,” said Bishop Timothy C. Senior, rector of St. Charles. Tickets for Music, Ministry and Faith benefit concert are $75 and can be ordered through www.scs.edu. The Spiritual Year program at St. Charles, which is the beneficiary of the “Music, Ministry and Faith” concert, is a special year set aside before theology studies after completion of the seminary’s college years or after completion of a pre-theology year by men who enter the seminary post-college. At this time in its second year of operation, the program hosts nine men, seven of whom are are in priestly formation for the Philadelphia Archdiocese. They are temporarily located off-campus in the former facilities of Don Guanella Village, Springfield. While the Spiritual Year comes under the Theology Division of St. Charles Seminary, headed by Vice Rector Father Patrick J. Welsh, the program’s director is Father Christopher Cooke. St. Charles pioneered the Spiritual Year among Catholic seminaries in the United States. It was first established for the Philadelphia Archdiocese in 1991 by Cardinal Anthony Bevilacqua at Mary Immaculate Seminary, a former Vincentian Seminary in Northampton, Pa., which continued for a decade and a half. That property has recently been sold. 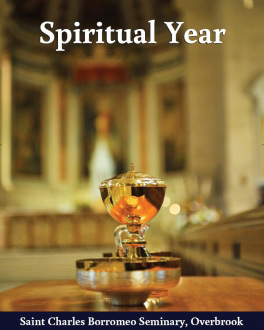 The Spiritual Year instituted for Philadelphia in 2014 more closely resembles the program in use by the Archdiocese of Denver, Archbishop Chaput’s former diocese. “The Spiritual Year is really an opportunity for an intensified experience of communal living as part of a man’s discernment or continued discernment,” Father Welsh said. The program begins in August, a month earlier than the academic year at St. Charles and ends in June. During that time the seminarians do not take formal credited courses, but focus on developing their spiritual life in a format more akin to that of a monastery than a college. “We find it is in community living that the best spiritual formation takes place,” Father Welsh said. Over the course of the year the seminarians attend conferences, daily Mass, Holy Hours and periods of prayer. During weekdays, Monday through Friday, the seminarians are subject to what in this generation may be the most challenging aspect. There is a complete media blackout – no television, cell phones or computers. “Hopefully this does away with distractions,” Father Welsh said. The year “strives for a life-experience which will allow the seminarian to ‘find God in all things’ such that the stillness of the year — freed from academic grades — will foster a solitude in the heart to remain with the candidate through ordination and priestly life,” a seminary description of the program explains. On an interpersonal level, the media abstinence also facilitates interaction by the seminarians with one another. “We are not preparing them per se for living with other people but we are preparing them to engage with other people,” Father Welsh said. “By living with others in close proximity it is an opportunity to polish the rough edges that sometimes might be there and to work on the social interaction that is going to be so essential to them as priests. This year there are nine seminarians, seven for the Philadelphia Archdiocese and two from other dioceses, according to Father Cooke. That number will probably grow in the future based on the uptick in enrollment St. Charles Seminary is experiencing. Father Cooke was himself a member of one of the last classes from St. Charles to do their Spiritual Year at Mary Immaculate. He sees noticeable differences between then and now, including the media fast, which was not as big an issue in past years. There is also a closer connection to the wider community at St. Charles than his group experienced, if for no other reason it is in close proximity. Although they are living apart from the rest of the seminary, the men in the Spiritual Year are not completely out of touch with it. On Wednesdays they return for an evening Mass, community dinner and relaxation with the other students. Over the course of the year they will have three retreats: a three-day retreat, a directed five-day retreat and at the end of the year, a full 30-day Ignatian Retreat. Although there are not grades given, the men will have read the entire bible and the Catechism of the Catholic Church and attended lectures and group discussion groups. Other highlights of the Spiritual Year include being sent out for a month, two by two, (or two by three in one case) to another East Coast diocese for social ministry perhaps to work among the elderly, the homebound and the homeless. They also return to the main campus for special events, perhaps a lecture or special liturgy, and of course for the recent visit by Pope Francis. For relaxation there are also group visits perhaps to a soccer match or a museum or other cultural activities and Saturdays are usually free days when the men are on their own. All in all, “There is positive energy in the program and I think the men do benefit from it,” Father Cooke said.